Browsing "Monday Madness – Anything Goes!" Use your scraps to make this Little Scraps – Churn Dash. This miniature quilt will be 18 1/2″ square when you finish. This Tea-Lightful table topper is 24″ square and is made with foundation piecing. Make your teacups with pastels or bold colors or use your floral scraps to make them look like fine china. When you’re talking babies, Noah’s Ark is a timeless theme. This 48″ square quilt has a center applique surrounded by several borders for a beautiful finish. Slice And Dice is made from 10 long quarters (not fat quarters). Slice and dice and sew and you’ll see the blocks coming together quickly. This lap sized quilt can be as bright and bold as you want! Isn’t the colorful, narrow border pretty? It’ll be made from all your leftover scraps from the project. Grab your favorite Jelly Rolls and Charms. All the cutting is done – you’ll have this quilt together in no time at all! At 58″ x 78″ this quilt, Ups & Downs, is just right for a twin sized bed spread. So easy you’ll probably want to make this one over and over. Would you believe Mosaic Magic is made from just a modified log cabin block?! After you make the quilt with the layout shown here you can make another quilt and play with the blocks – they can be set in many different ways for many different looks. Instructions are included for several sizes including a Queen size. If you want make a king size quilt really quick, here’s a pattern for you. Road To Tokyo is made of four patches, squares and blocks of two rectangles – all simple, easy-as-pie pieces, but the results are striking. You’ll be snuggling under this quilt before you know it. An eclectic selection of patterns . . .
What little boy wouldn’t love this quilt? All the vehicles they love to spot on the road. Emergency vehicles, working vehicles, cars, and a school bus can all be found on this quilt that has just about anything with Wheels. Fat quarters will work great for the background squares and you can use up some of your scraps for the applique. The Peek-A-Boo Car Seat Cover will keep a little one warm and cozy between the house and the car without the need for lots of bundling and fussing. Then it can be removed after you get to the car so baby can be comfortable and not all sweaty from a lot of extra clothes. Elastic edges make it a snap to put on and take off. This purse pattern, To Patch Or Not To Patch, has five design choices with complete instructions and plenty of color pictures to help you choose which style you like best. You can patch or not, you can quilt or not, but I bet you can’t stop at just one! Two pockets outside and lots of pockets inside that you can customize. Mosaic Medley uses three variations on a nine patch block to give you three very different looks. Lots of sizes from which to choose. These quilt go together quickly – great for a baby quilt or Project Linus. Celtic Wedding Rings is an easy to make quilt – just three basic blocks – with an dramatic payoff. This quilt finishes at 86″ x 112″. Save yourself some time and trouble and use the Apple Core Die Cut Quilt Kit. Each kit contains 11 different fabrics and enough pieces to make a 40″ x 40″ quilt. 2 kits make a throw, 4 kits make a twin, and 6 kits make a queen size quilt. You select the color way from four choices. This twin size or lap quilt, Nine Patch Seasons, is traditional nine-patch blocks set on point and surrounded by your choice of applique . . . leaves, stars, birdhouses and flowers, or presents and stockings. These Fusible Fabric Boxes will help with storage and with decorating! Make them to match your decor. Use bright fabrics and make them stand out in the kids room or subtle fabrics to blend in with your family room. Make some for you sewing room too. And, get this, no sewing! Calendar Baskets will always be in season. 12 different baskets filled with seasonally appropriate items are surrounded by a beautiful flowery vine. If you love applique this will keep you happily busy, and the result will be a quilt that will be treasured for years. Worth The Hike . . . with scenery like that I’d have to agree! By Granola Girl Designs this wall hanging will make you want to hit the trails. One of the tone on tone fabrics from the new Nature’s Bounty line would work great as the border for this quilt. Cat Purses are just purr-fect for when you only need a couple items with you. And what little girl wouldn’t love to have one . . . or two?! Have fun with the embellishments – can you make them look like your cat? Keep with the theme and use a cat lead for the handle. A selection of projects with nothing in common but fun! Cheep Housing for the whole neighborhood. Five birdhouses and four quick blocks and you have a little town for the birdies. A narrow border surrounded by scrappy squares will complete this 34″ x 40″ wallhanging. Just right for fat quarters or for using up your scraps. Simple piecing and a bit of applique are found in this Apple Pattern tabletopper. It’s the right time of year for Lil’ Friends Hooded Jacket. Fusible web puppies are made happy with little button bones. Fusible web kitties have some mice to chase after. A hood to keep the head warm and side pockets to keep the hands warm (or to store a puppy treat!) and your little one is all ready to head outside. No Carb Sampler will fit right in with your diet! This 48″ wall hanging is made of 25 blocks and will look good in many different color ways. The black background makes the bright colors stand out. A white background with pastels would be very pretty. Just two colors would be another look. And you just might discover a new favorite block in the process. The Star Tote pattern comes in two sizes with two different stars. The smaller size will work great for a “green” lunch bag . . . a sandwich, chips and a cookie or two, and no paper bag to throw away. The larger bag is 9 x 9 x 14. Just right for a trip to the library, or holding a sewing project or even a casual purse. Make all four – you can never have too many totes. Welcome back to Monday Madness – Anything Goes – an eclectic selection of patterns and projects. Critter Caboodle is 36 pages of adorable critters in seven different quilt projects. Instructions for piecing and for applique techniques. Having It All is a pattern by Indygo Junction for a backpack that doubles as a shoulder bag. There are instructions for adding, if you choose, a front pocket and bottle holder. 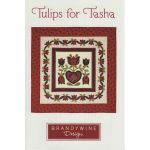 Just one simple block - you pick the size: 10″ or 5.5″ You can achieve so many different looks depending on your fabrics and the layout. You won’t want to stop at just one of these I’ll Tumble For You quilts. And you can choose the size: 45″ x 56″ or 45″ x 75″ . Pinwheels surround these Chubby Chicks and they are just so cute!! Charms would be perfect for the chicks or you can use up your scraps. Then add cute little embroidered feet and button eyes. Annie’s Winter Fun is a pattern for an adorable 22″ rag doll. She’s all dressed up for some fun in the snow. With her snowman in one hand and her sled in the other she’s ready! Scrap Sack II is like the original – only better! There’s a pin cushion on top to hold your pins and to hand your scrap sack off the edge of your sewing table. There’s a pocket for your little tools . . . you know . . . your best friend, the seam ripper. And scissors lease so they are always handy. Just two fat quarters needed. These are so handy – they’d make a perfect gift for your sewing buddies. Welcome back to Monday Madness – an eclectic selection of patterns. It’s getting colder and you’re going to need to keep those feet warm! These “big foot” slippers are made using the Flannel Chenille technique. Sizes for everyone from x-small to x-large; from narrow to wide widths. Make a few extra for Christmas gifts. Who wouldn’t like a new pair of comfy slippers? Churn Dash is a miniature quilt. It finishes at 18 1/2″ square. Use your scraps for this cute quilt. You could make a few with different color variations and they would make a nice grouping. The Happy Quilt is a 35 1/2″ square quilt that will brighten up any wall. Easy triangle shortcuts are included in the pattern. Straddling Scarecrow is enjoying the fall. Just one in a series of Straddling characters, each one is constructed the same way and measures the same size. Applique on a pieced background with borders to frame it all. Dig out your scraps and make covers for scrapbooks, photo albums, paperbacks. Plus instructions for bookbags, bookmarks, glass cases. More than twenty projects are found in Scraps & Books & Covers. Baby’s Bow Wow Blanket works as a wallhanging or to snuggle baby. Easy four square blocks as star centers plus simple applique doggy pull toys make a whimsical quilt. Make it scrappy or match the nursery’s color scheme. Makes a great shower or new baby gift. Kizmet Klutch comes in two sizes. Make the large one with bold fabrics for a casual bag for everyday use. Make the smaller one with more sedate fabrics for an evening bag.